I will start to sell antique pottery and items made by famous potters. So, I present the Kakiemon kiln today. They have over 300 years of history. Because I got some green tea cups and will sell the cups on my web shop. The first Kakiemon (1596-1666), the originator of Kakiemon porcelain, became known as “Akae” for the first time in Japan around 1643. The early Akae works were copied from Manreki Akae of the Ming dynasty in ancient China, which had been brought to Hizen Hirado port at that time. Later the pattern of Akae was changed by Kakiemon to a pattern of his own like Japanese painting. Akae used techniques of over-glazing with delicate polychrome called “Gosai” (five colors) or “Shichisai” (seven colors) on the milk-white foundation. This was called Kakiemon-style and was known all over Europe. From the 17th century, the Dutch East India Company carried Kakiemon to all parts of Europe instead of the products of Keitokuching, the Chinese national kiln. 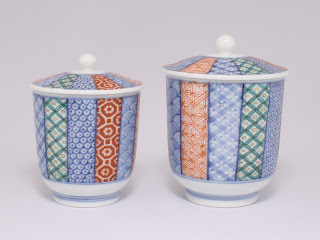 European people copied from the excellent Kakiemon works and produced porcelain there. Still now you can see European Kakiemon produced, especially in the Meissen kiln of East Germany, the Chelsea kiln of England and Delft kiln of Holland.